More than a year ago, I wrote a column telling how Sophie—the cutest dog in the whole world–attacked and killed a skunk in a blackberry thicket in our pasture. Before it died, the skunk got its revenge. Several baths over the course of several weeks were required before Sophie recovered her natural doggie smell. A few months later, after our house was skunk-soaked during what must have been a wild middle-of-the-night party, I wrote another such column. And a follow-up about how we finally got rid of the odor. With the weather so wonderfully temperate this time of year, George and I open our windows whenever we can. A couple of weeks ago, we were awakened shortly before dawn by that old familiar smell. Thankfully, it seemed to not have permeated the house but was confined to the back yard, near where the dogs are fenced in. I soon discovered exactly where it was coming from. Lying in a patch of early morning sunlight inside the dog pen was a big dead skunk. How the heck had it gotten there? I don’t allow my dogs out of their pen unsupervised. There are just too many ways for them to get hurt or be a nuisance to the neighbors. I would have noticed if the dogs had killed a skunk during one of our pasture romps and dragged it home. I’ve seen them do it too many times with groundhogs and muskrats and moles. Shifting my brain into detective mode, I deduced that the skunk must have entered the dog’s yard alive and of its own free will. Had it had wandered in through the gate while I had them out for playtime? If so, how come they didn’t kill it right away? Their sniffers are too good for any kind of animal to escape notice for very long. Could the skunk, perhaps, have climbed a tree in the middle of the night and accidentally fallen into the pen? To see if that was a possibility, I went to the Internet to find out whether striped skunks climb trees. The answer is no. Their long claws can take them up a tree but are too much of a handicap coming down. But skunks are able to climb wire mesh. Maybe this one, not knowing that Sophie and Iniesta were inside the pen, had ventured into it in search of a midnight snack. He definitely unloaded before meeting the Grim Reaper. But though the dogs smelled faintly skunky, they weren’t covered with the odor. How come? Had they lunged at the intruder from a safe distance until he ran out of ammunition and then attacked him? 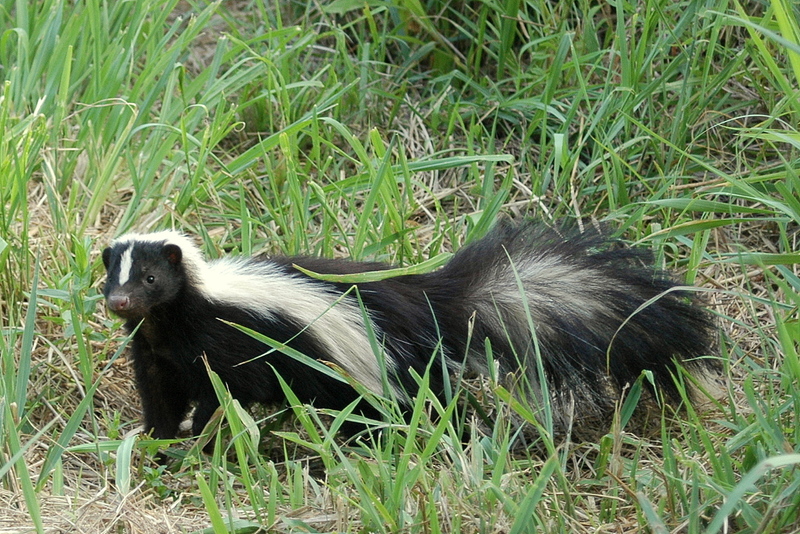 Further research revealed that skunks can spray five or six rounds before the well runs dry. It then takes a day or longer to recharge. Sophie and Iniesta must have harassed Mr. Skunk until he was squirted out and then moved in for the kill. Knowing how much George loves disposing of wild animal carcasses, I waited until he got home from work to do anything about the dead skunk. I was tasked with moving the dogs away from the crime scene and keeping them distracted while he scooped the skunk onto a massive pitchfork and carried it off into the woods. The dogs didn’t offer to go near it. As for the buzzards, that’s another story. One that I just might write about in an upcoming column.